I Wanna Know How To Solve This Error. I´m trying to get a BFHeroes object working in the BF2 editor to use it in a BF2142 map, this looks like something hilarously XD, and I wanna to know why the editor says: Texture not found, I´ve the textures into the correct place or atleast i think so. Have I to put them into the exact path that the editor says?, for example into: "objects/vegitation/textures/mt_cypress_lod" or can I attach them to the object in a different location than the default one?. Also, please doesn´t refer me to others tutorials I have been reading them step by step, especially one where you have to created a objects_client.zip folder into your Level, but that isn´t for this, I think. Plus, I want the BFHeroes objects, for personal use, especially vegitation thxxx. Here is that tutorial you asked for.. it has information about extracting BFH objects and setting up the editor to use them. You can open the mesh files iwth BFmeshview and look at the texture loading paths. Have I to put them into the exact path that the editor says?, for example into: "objects/vegitation/textures/mt_cypress_lod"
I havent modded BFH before but this seems like it would be wrong. 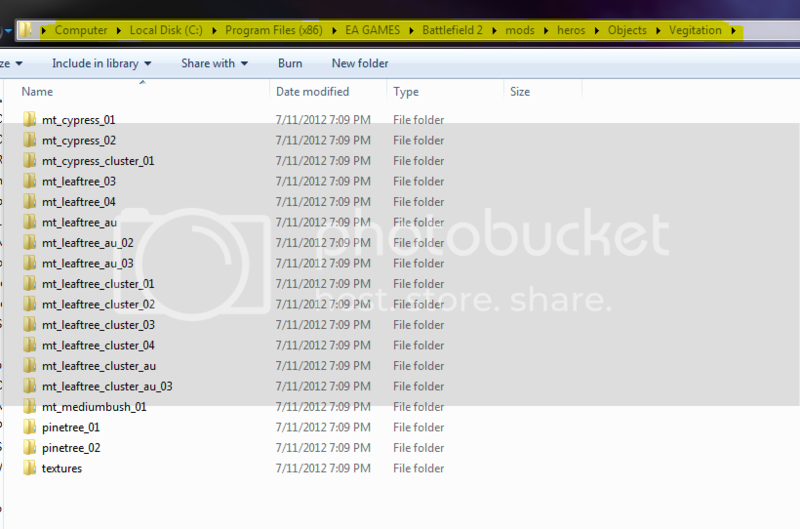 Normally there is one more folder after vegitation that contains all the objects and textures from one theater. can I attach them to the object in a different location than the default one?. I assume you mean change the texture loading path? Use BFMeshview for this. Thanks, I´ve seen the textures into the Viewer, now I hope to see them into the editor too. EDIT: I don´t get the textures to run into the editor, I have them into a textures folder in the vegitation folder, into the BFMeshviewer I see them, but into the editor they don´t run properly. Please help me, I have to done something with the Object editor? BFHeroes vegitation is unable to run properly in the editor?, there is a way to change the texture path INTO the BFeditor? First, I was wrong. This texture path is correct. Sorry about that. I got the vegitation working in BF2 by extracting both the vegitation_client.zip and vegitation_server.zip to this location in a mod I created called Heros. It will probably work in any mod though. All objects showed up in the editor with textures and I was able to paint them onto a map with the overgrowth system. I did not have to edit any texture paths. Keep in mind I tested this in BF2 not 2142 but it should work. there is a way to change the texture path INTO the BFeditor? You cannot change materials or texture paths with the editor. it is not something it does, but it definatly should be. I won´t give up, but maybe I should extract them again, at really I have done same as you, extracting first vegitation_client.zip and then vegitation_server.zip into the exact same folder, then I put it into my BF2142 objects folderbut the editor doesn´t load the textures with the mesh correctly. Im putting the threes with the level editor, cuz I don´t know how to use the overgrowth thing, I have done some mistakes? Also, im putting into the map the cypress_01 not the cypress_01.lod are they different?